Santa jacket, trousers and hat made of thick felt; the jacket, lined on the inside, is adorned with a white band of faux fur, 4" (10 cm) wide. Featuring a zip, it also has snap fasteners at the collar and waist. The hat is trimmed with white faux fur and a pompon. NB: wigs do not fit beneath the Santa hat (meaning that the beard’s elastic strap may remain in sight). Santa beard – white and thick, and measuring 12" (30 cm) in length, it is held in place with elastic straps. 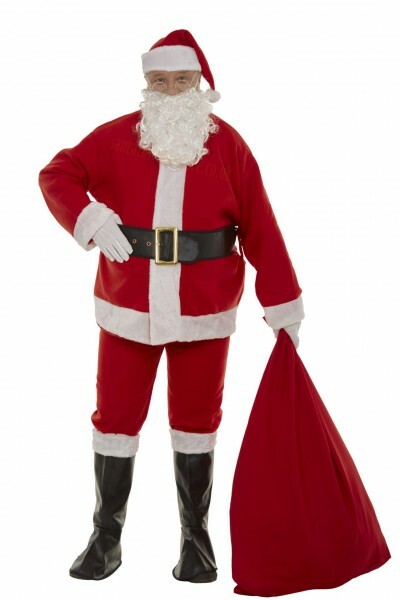 Santa belt – broad (3.5" / 9 cm) and suitably long (60" / 150 cm) for Santas of all ranges of girth to be able to use it. Adorned with a gold coloured buckled. A smart addition to the Santa outfit. Santa boots – in the form of special boot covers, made of imitation leather; 22.5" (56 cm) in length, trimmed with white faux fur. Elastic straps at the bottom pass beneath the soles of the wearer’s shoes to hold the boot covers in place. 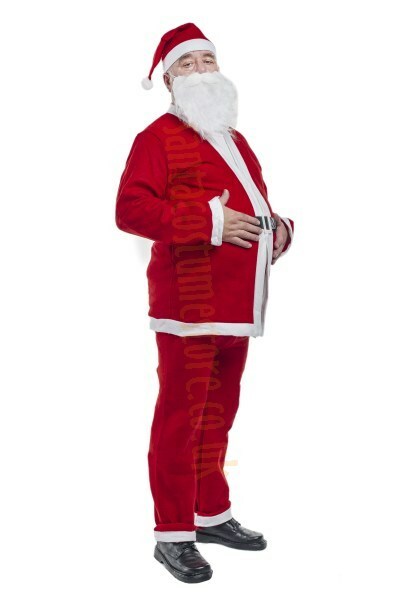 A Santa outfit without the right footwear loses a great deal. White gloves – made of cotton, and a perfect complement for the Santa costume. 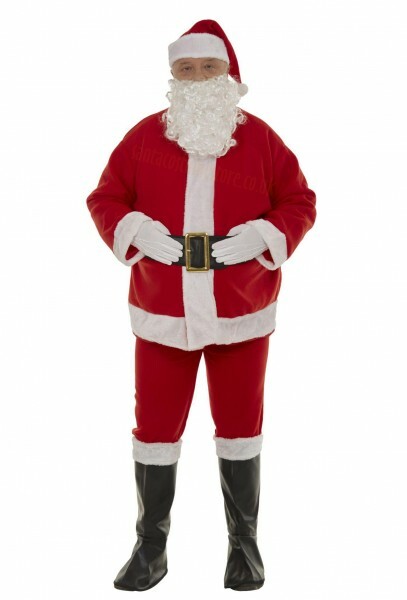 This Santa suit is suitable for people of heights 5'3"-6'2" (160-190 cm); for details, see the Measurements chart.